You are here: MacNN Forums > Software - Troubleshooting and Discussion > macOS > Does this Crash Report look suspect? Does this Crash Report look suspect? My MacBook is periodically crashing, only staying up 30 minutes or so. It is just out of warranty this month, ironically. The screen suddenly goes to black, the drive resets, but no responsiveness. I have to hold the power button to shut off, then reboot. It looks like a hardware fault or cooling issue to me. Particularly because a reinstall didn't fix it. Be nice if it's RAM or the HD, as those are the only parts you can swap out. Have you had the case open yet? Was the cooling system filled with dust? Do the fans run audibly all the time (or always silent)? Peer into the vents - they're hidden on the back, venting back when the screen is closed. With the screen open, some hot air goes up the front of the screen, from under the hinge. note: if the vents are heavy with dust, do not blow compressed air in from the outside. You have to open the case, and blow the crap out. Not deeper into your Mac. Run the Apple hardware Diagnostics: hold down "d" during boot. If your local drive does not have a valid copy of the diagnostics (nothing comes up) try holding option-d to load the diagnostics over the internet. 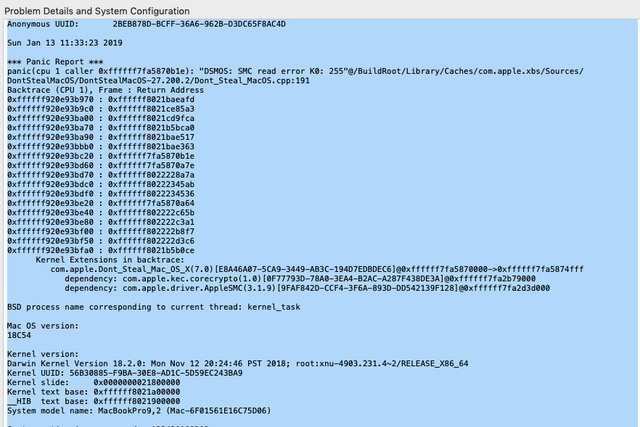 MacNN Forums > Software - Troubleshooting and Discussion > macOS > Does this Crash Report look suspect?